The boys love “getting creative” (honestly, they actually say that!) but the mess can get too much for me. It’s not every day that I can face glue and glitter. If this is how you feel too read on for a way to keep everyone happy! 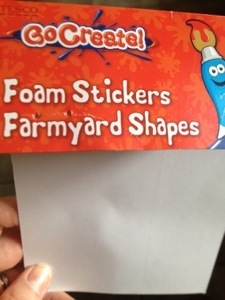 We picked up these foam stickers in Tesco a few weeks ago, you’d probably find similar in your local euro shop. We got them for about €1.80, some sets were reduced to €1.30. I gave the boys a piece of green heavy paper each, I pick these sheets up from time to time in the local stationery shop, they keep homemade cards interesting. 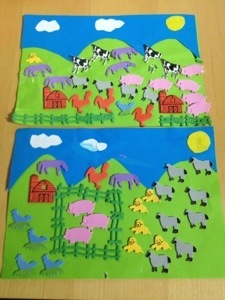 I cut the sky for them from blue paper and shaped it to look like there were hills, then they used glue sticks to stick the sky on to the green page. We cut clouds from white paper and the sun from yellow felt that we found in the make and do box and the boys chose how many they wanted each and glued them on with a glue stick. They just love glue. 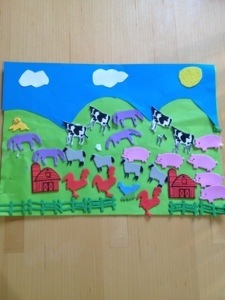 Then I left them to their own devices with the foam stickers and the colouring box. They played QUIETLY for ages making patterns and giving serious consideration to where the cows would like to live and who had the biggest herd. There was a slight issue over the smaller boy taking too many cows but we got over it. We’ve since bought the zoo packet and the flowers and butterflies one too. I love these stickers as they keep the kids amused and the only mess is the peel off back of the stickers. The finished product looks great too. I’ve a few stashed away for rainy days, you should too! 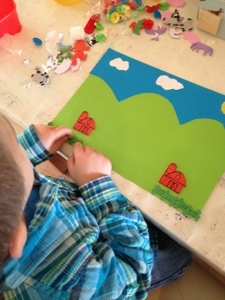 art, Arts and craft, make and do, play, rainy day activities. Bookmark. You can’t go wrong with a few stickers! My girls love them. In fact we made our Easter Bonnets this year using foam stickers and they were a big hit. And wonderfully unmessy. And peeling the backs off them is also great for building fine motor skills – so it’s win win all round! My favourite place to spend time with my rambunctious almost-3-year-old is the conservatory my husband and I had built onto our home when I got pregnant and didn’t feel very well, which severely limited the amount of time I could spend outdoors. Nowadays, we spend a lot of time there, even when it rains. The drops of water trickling down the windowpanes just fascinate him…he’s actually tried to count them!